Technically, the northern lights are what happens when electrical particles from the sun collide with gases in Earth’s atmosphere. But you don't need to know the why to appreciate the beauty. The astronomical greens, reds, purples and yellows of the aurora borealis are hypnotizing. • Only here: Alberta is home to some of the world’s largest dark sky preserves, including Wood Buffalo and Jasper national parks. That means there’s no artificial light around to obscure the extraterrestrial view. • Good to know: Your best shot to see the aurora borealis is September through mid-May. Visit for the Jasper Dark Sky festival in mid-October and, in addition to the view of the stars, you’ll get hands-on science and astronomy events. 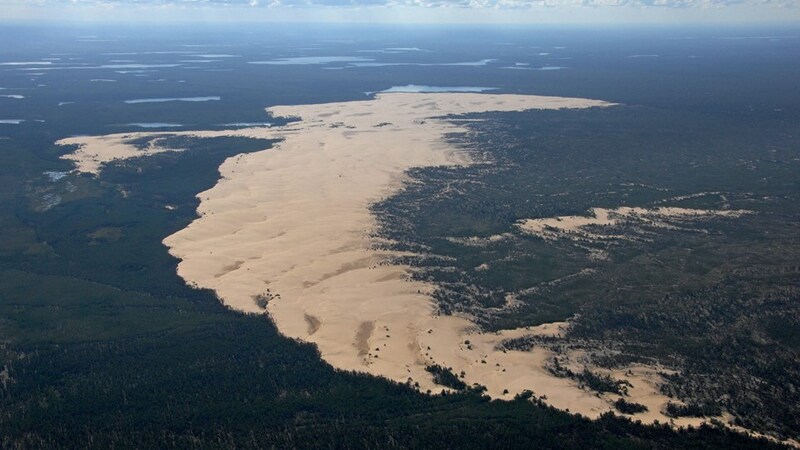 The corner of northern Alberta that is the sprawling Regional Municipality of Wood Buffalo is known for its sands. 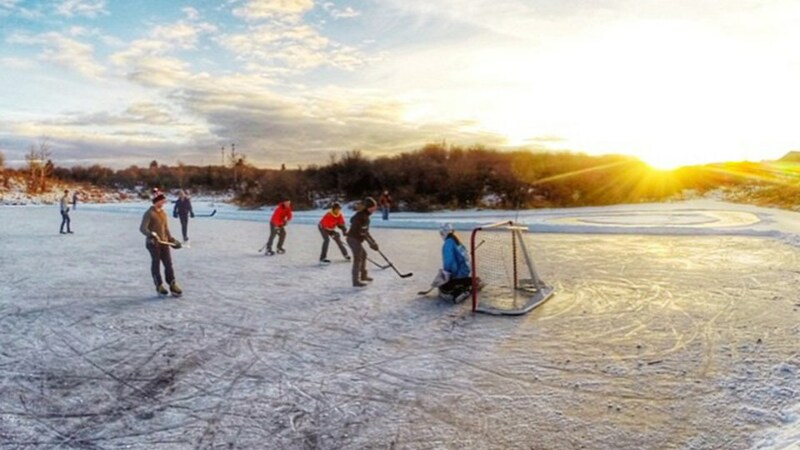 All over Alberta you'll find amazing ways to enjoy the magic of winter. Due to its high elevation and lack of urban light pollution, Cypress Hills was the first designated Dark Sky Preserve in Alberta. Every August the Royal Astronomical Society of Canada holds a Summer Star Party that's considered to be one of the largest stargazing events in the country. The park also offers a variety of camping options, so cozy up by the campfire and gaze in wonder at the starlit sky. If the conditions are right, you may even see the Northern Lights. This 300 sq km (116 sq mi) dark sky preserve, just east of Edmonton, encompasses Elk Island National Park and neighboring Cooking Lake-Blackfoot Provincial Recreation Area. By reducing artificial light, the preserve increases the visibility of the night sky. Whether you stargaze around the campfire or attend the preserve's annual Star Party in September, you'll find that the night sky shines brighter in Beaver Hills. Due to it's vast size and location, the 11,000 sq km (4,247 mi) Jasper National Park is considered to be the world's largest accessible Dark Sky Preserve. It's also one of best places to stargaze in the Canadian Rockies. Every October the park holds a Dark Sky Festival that includes both free and ticketed events and workshops. You can learn about the constellations, listen to aboriginal songs and stories and even pick up some tips for photographing the spectacular starlit sky. Discover and photograph the dancing lights of Aurora Borealis on a 3 day tour that includes accommodation, transfers and snow shoeing. Discover and photograph the dancing lights of Aurora Borealis on a 4 day tour that includes accommodation, transfers and snow shoeing. Rocky Mountain Photo Adventures is a Banff based, locally operated business offering custom designed tours, workshops and seminars in Banff National Park and the Canadian Rocky Mountains. We are knowledgeable and super enthusiastic about developing your photography skills and enjoyment of our amazing scenery in this world-class travel photography destination. We are passionate about the wider photography community and actively engage in educational, environmental and wildlife events and projects, both independently and through partnerships. Rocky Mountain Photo Adventures is a proud sponsor of the iconic Banff Mountain Film and Book Festival. Lens on Nature’s mission is to enable our guests the opportunity to immerse themselves and experience the remote beauty, history and culture of Fort Chipewyan, one of Alberta’s most isolated and northern communities. They offer carefully created, professionally guided three day adventures which include travelling a 280 km (174 mi) road made entirely of snow and ice to Fort Chipewyan, dog sledding, ice fishing, snowshoeing, historical tours and a chance of seeing aurora borealis. With each trip, guests receive a collection of inspiring images in a professionally designed hard cover book that captures the sense of authenticity of their adventure. Dark Sky Guides Ltd. offers guided interpretive stargazing tours that focus on the dark skies of Waterton Lakes National Park. Different tours are offered in various front-country and back-country locations and serve to educate tour participants about the night sky, dark sky initiatives, and Waterton Lakes National Park in general, while at the same time providing participants with the opportunity to stargaze using quality telescopes, binoculars, and other stargazing equipment. Dark Sky Guides endeavors to provide a personable, high quality, memorable, entertaining, and educational tour, which encourages people to foster their own personal connection with both the night sky and Waterton Lakes National Park. Blast off with astronomy experts for a dining and stargazing experience at a Jasper SkyTram Star Session. The SkyTram takes you one kilometre closer to the stars where you can view them through powerful telescopes under the darkest skies in the Rockies. Enjoy a guided tour of the solar system; you might even see a meteor or the Northern Lights!